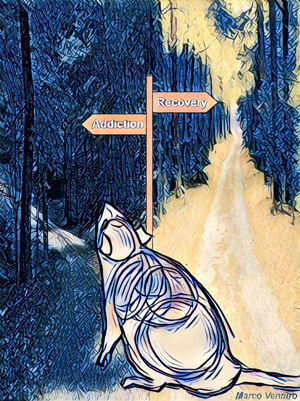 A team of researchers at the National Institute on Drug Abuse (NIDA) has identified what may be the crucial brain circuit involved in relapse to drug use when an effective behavioral treatment for drug addiction, known as contingency management, is discontinued. Contingency management uses non-drug rewards, such as cash stipends, prizes, or coupons for retail goods, to encourage people to remain drug-free. Most patients, however, will relapse when they no longer receive the alternative reward. Researchers used an animal model, where rats voluntarily abstain from drug self-administration when given food rewards. In this model, the rats choose to abstain from methamphetamine or heroin when an alternative non-drug reward is available, but relapse to drug seeking when the alternative reward is removed. Using chemogenetic manipulations, electron microscopy, and other techniques, the scientists identified the anterior insular cortex-to-central amygdala nerve path as critical to the relapse process. These findings provide insights into the brain mechanisms underlying relapse after successful contingency management treatment and identify a potential novel target for relapse prevention using brain stimulation methods. The research was performed by Marco Venniro and other members of the laboratories of Yavin Shaham and Marisela Morales at the NIDA Intramural Research Program, in collaboration with other NIDA investigators, and extramural investigators. For a copy of the paper, go to “The anterior insular cortex→central amygdala glutamatergic pathway is critical to relapse after contingency management,” published in Neuron. NIDA. "Study identifies a brain pathway involved in drug relapse after cessation of contingency management." National Institute on Drug Abuse, 11 Oct. 2017, https://www.drugabuse.gov/news-events/news-releases/2017/10/study-identifies-brain-pathway-involved-in-drug-relapse-after-cessation-contingency-management. NIDA. Study identifies a brain pathway involved in drug relapse after cessation of contingency management. National Institute on Drug Abuse website. https://www.drugabuse.gov/news-events/news-releases/2017/10/study-identifies-brain-pathway-involved-in-drug-relapse-after-cessation-contingency-management. October 11, 2017.